Behavioral counseling may be especially effective in younger patients who have yet to establish sun safety behaviors. Based on a systematic review of the relevant data, the conclusions of the task force were as follows. There is sufficient evidence indicating that behavioral counseling interventions lead to a moderate increase in sun protection behaviors among individuals with fair skin types aged 6 months to 24 years. For example, 5 of the 6 trials involving children and adolescents demonstrated significant improvements in sun protection behaviors vs controls, as reported by parents. There is sufficient evidence to suggest that behavioral counseling leads to a small increase in sun protection behaviors among individuals with fair skin types older than 24 years. There is insufficient evidence supporting the preventive benefits of counseling adults to perform skin self-examination. The harms associated with behavioral counseling and resulting changes in sun protection behaviors were deemed small. In the studies reviewed, all interventions aimed at children and most interventions for adults focused on sun protection behaviors such as avoiding sun exposure and indoor tanning; using broad-spectrum sunscreen with a sun protection factor ≥15; and wearing sunglasses, hats, and sun-protective clothing. Modes of delivery for the interventions ranged from mailings and print materials to web-based, telephone, and in-person counseling. Compared with the previous recommendations, the updated statement includes a greater age range for behavioral counseling (previously recommended for patients aged 10-24 years). Another new addition is the recommendation that “clinicians consider selectively offering counseling to adults older than 24 years with fair skin types,” as stated in the paper. The US Preventive Services Task Force has published recommendations for behavioral counseling to prevent skin cancer, emphasizing education in young persons based on the highest levels of evidence available. This publication highlights the importance of patient counseling by dermatologists and nondermatologists. The lack of recommendation of behavioral counseling for individuals over 24 years of age should not be interpreted to suggest that excess sun exposure after this age cutoff is inconsequential. Rather, risk awareness is developed in individuals of this age and behavioral patterns are established, making counseling more challenging. Oftentimes, repeat counseling over several appointments proves worthwhile. The risk of exposure to artificial UV light should also be stressed to young persons. Indoor tanning significantly increases the risk of melanoma and nonmelanoma skin cancer. A lack of evidence for skin self-examination should not be misunderstood as evidence against skin self-examination. The lack of nonmelanoma skin cancer outcomes tracking in national and regional cancer registries and the high frequency of nonmelanoma skin cancer in Caucasians make it difficult to establish a benefit of interventions like self-examination. 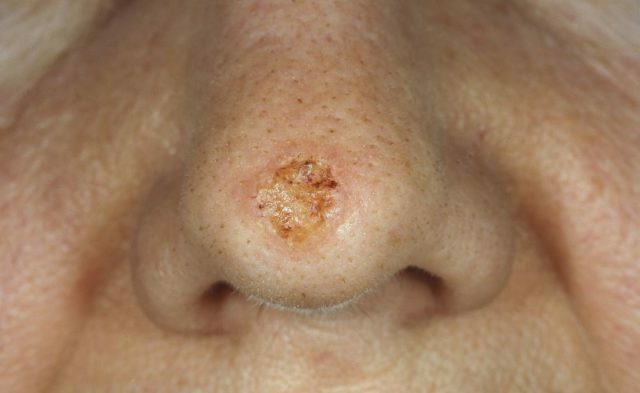 Nevertheless, especially high-risk patients should be counseled to bring changing moles and nonhealing sores to the attention of their healthcare providers. American Cancer Society. Cancer facts & figures 2017. https://www.cancer.org/research/cancer -facts-statistics/all-cancer-facts-figures/cancer-facts-figures-2017.html Accessed March 22, 2018. American Cancer Society. 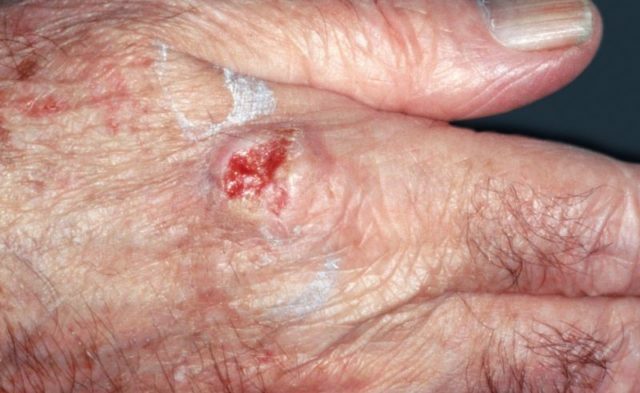 About basal and squamous cell skin cancer. https://www.cancer.org/cancer/basal-and-squamous-cell-skin-cancer/about.html Accessed March 22, 2018. US Preventive Services Task Force. Behavioral counseling to prevent skin cancer. US Preventive Services Task Force recommendation statement. JAMA. 2018; 319(11):1134–1142. Moyer VA; US Preventive Services Task Force. Behavioral counseling to prevent skin cancer: US Preventive Services Task Force recommendation statement. Ann Intern Med. 2012; 157(1):59-65. US Preventive Services Task Force. Screening for skin cancer: US Preventive Services Task Force recommendation statement. Ann Intern Med. 2009;150(3):188-193. Heckman CJ, Darlow SD, Ritterband LM, Handorf EA, Manne SL. Efficacy of an intervention to alter skin cancer risk behaviors in young adults. Am J Prev Med. 2016; 51(1):1-11.